We do tend to play “The Floor is Lava” quite a bit but we don’t usually build forts for some reason. 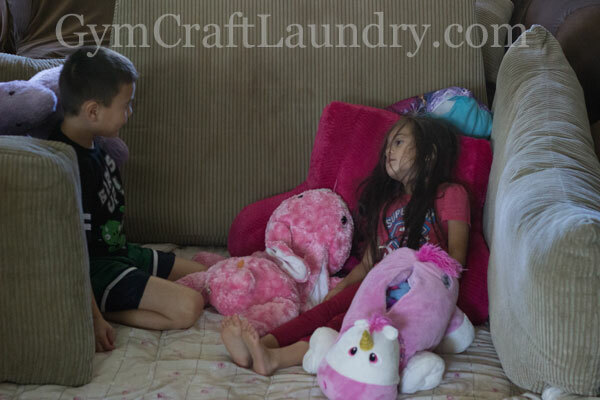 So my thanks goes out to the folks at Pop Secret for giving me the idea to have the kids build a pillow fort when I was too sick to take them outside and for sponsoring this post. The Scrugglets surprised me with their fort building ability. First they made “rooms” with the couch cushions. I was impressed with their teamwork and decided to make them a sticky treat to enjoy in their little hideout. 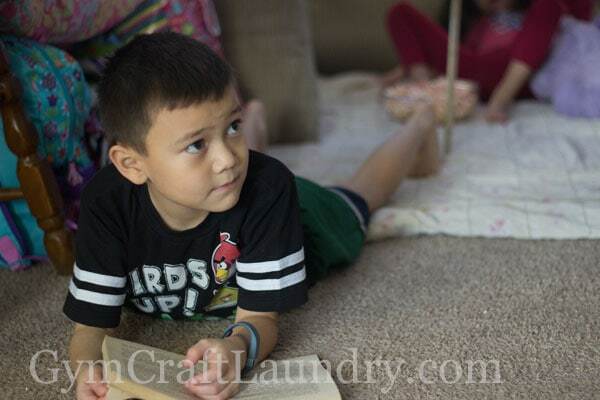 A pillow fort is perfect for reading! The other day, I left the sugar bowl on the counter after making myself some coffee and my seven year old son decided to put a spoonful in his milk. With a huge smile on his face he told me that his new favorite drink is “sugar mixed with milk because it tastes AWESOME!” Then I went to put away the sugar and caught Pea double dipping strawberries in the sugar bowl… They are monsters, I tell ya! 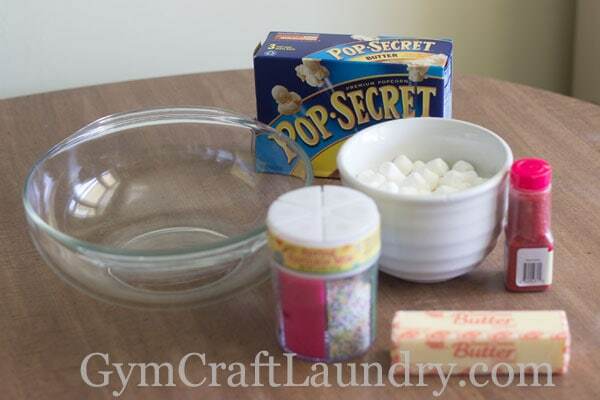 This gave me a great idea on a special treat for our pillow fort staycation day. 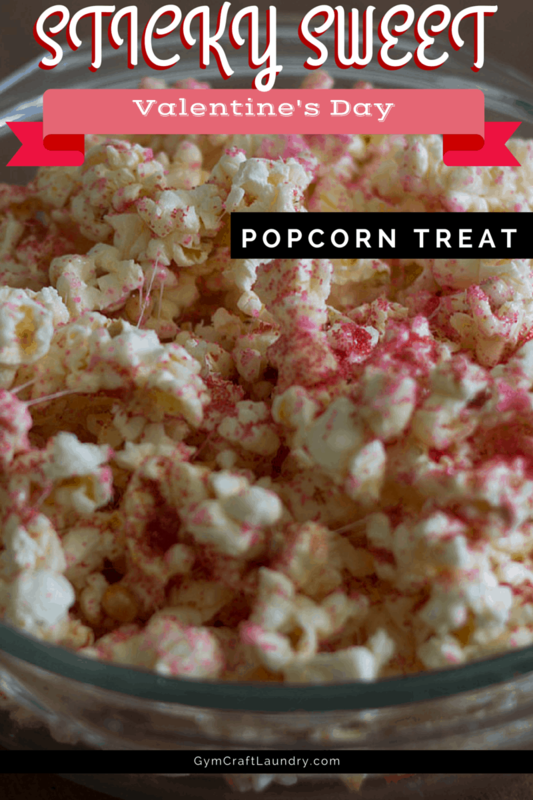 Pour the melted marshmallow butter mixture on the popcorn and stir while still warm. 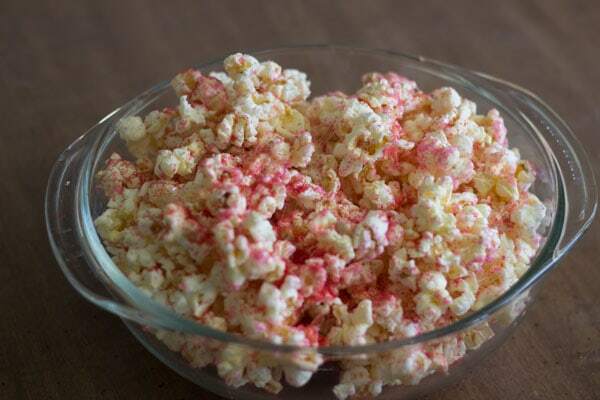 Shake the sprinkles onto the popcorn and marshmallow mixture while it is still warm so they will stick. You want the popcorn treats to me sticky but not one big marshmallow treat clump like rice krispy treats would be. These treats are perfect for Valentine’s Day too! 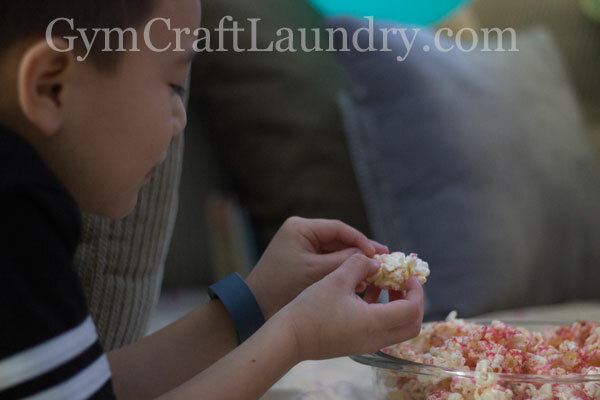 Pop Secret Popcorn wants to encourage families to have more fun together. That’s a campaign I can get behind! Be sure to visit Pop Secret’s facebook page to grab a $1.00 coupon to enjoy while you build your #PopSecretForts! Upload your fort onto Pop Secret’s Facebook page for a chance to win a secret prize pack! What a fun treat and a great idea for a play day inside! Echo recently posted…Chocolate Cherry Brownies! One day we will move north and I will experience this “snow day” thing lol. Melted marshmallows and butter make everything taste better! My kids would LOVE this! So hard not to join them though right?! I am glad I made these when my appetite was suppressed by my inability to smell lol! I tasted it though and it was yummy! YUM!! 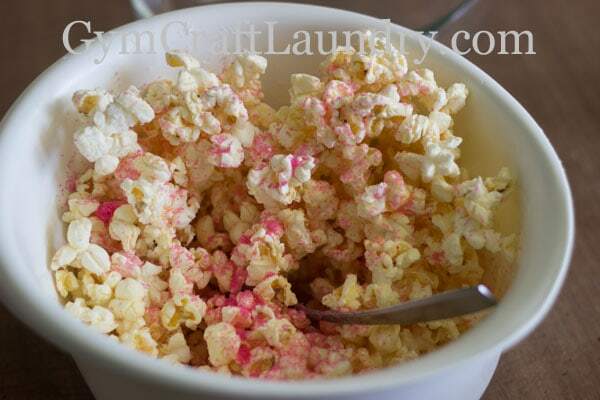 I love trying different types of popcorn and this looks delicious!! Hmmm…where did I put those marshmallows? The recipe is so festive! Perfect snack for the upcoming Valentine holiday! 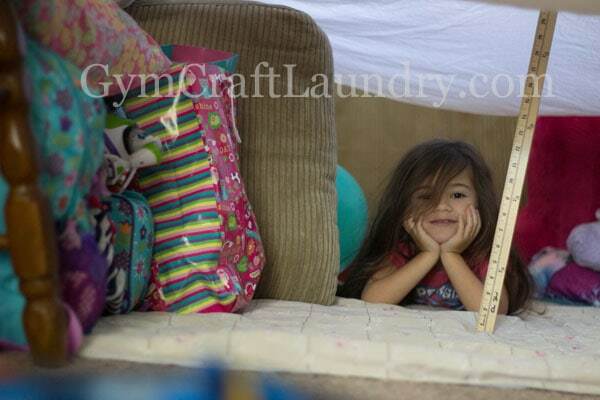 Popcorn, forts, and movies! Sounds like a great weekend 🙂 Those treats look like it would be a great big sticky mess, but sooooo worth it! Surprisingly it wasn’t! Maybe its because there really isn’t a lot of the marshmallow mix? It was sticky enough to keep the sprinkles on and maybe four popcorns stuck together but there weren’t gooey marshmallow strings like with my rice krispy treats. Aw, I loved the lava game growing up. Their fort looks great. Pinning. This looks yummy! This looks delicious! Thanks for sharing it. I can’t wait to try it. Hope your feeling better. Friday night camping movie night sounds so much fun. My son would love the sticky treat as well. Thanks for sharing on Merry Monday! My aunt used to make something similar but she added red hots she had melted over the stove top…spicy and yummy! 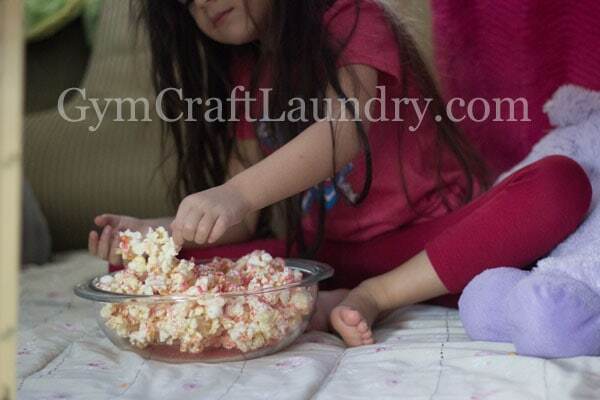 What a neat twist to popcorn/movie night. Yum! Thank you so much for sharing at the (mis)Adventures Monday Blog Hop. I really (and I do mean REALLY) look forward to what you share this week.